Most of the talk about next year’s Big Ten season will focus on the top flight talent that returns and rightfully so. The superstar quotient in the league is high as Kalin Lucas, Robbie Hummel, Demetri McCamey, E’Twaun Moore, JaJuan Johnson, and Talor Battle have all been named first team Big Ten players at least once in their careers. This post doesn’t focus on those guys because we know what they are capable of. Instead, this is a list of players who have the potential to breakout and go from supporting player to bona fide superstar. High offensive rating, low usage: These players were efficient but didn’t get enough shots meaning that if they become a bigger part of the offense, their stats should increase dramatically. High usage departing player ahead: These players were essentially blocked by a superstar that was the focal point of the offense. In-season improvement: Ending the season on a high note isn’t fail proof but sometimes when the light goes on, it stays on. Showing signs: This one is a little more subjective and applies to the young players that just haven’t had a chance to shine. William Buford – Jr. – Ohio State – Can a player that averaged 14 points and 6 rebounds per game really breakout? In Buford’s case I’ll say yes. Buford was a tenth of a percentage point away from Pomeroy’s “major contributors” category (using >24% of team poss.) and had he fallen in that category his offensive rating would have put him fourth – a smidge ahead of all-World teammate Evan Turner and behind only Jon Leuer, John Shurna, and Kalin Lucas. I expect to see Buford on the All-Big Ten first team when all is said and done. Durrell Summers – Sr. – Michigan St. (Stats) – If you are anything like me you probably have had summer nightmares of Summers’ ridiculous NCAA tournament statline: 18.8 points, 5.6 rebounds with a 67.4 eFG%. We always knew that Summers had the talent but he had never put together a stretch quite like that. He probably got more looks without Kalin Lucas but there should be plenty of shots in the MSU offense with Raymar Morgan and Chris Allen’s departures. If Summers can find consistency this year, forget the Big Ten, the whole country better take note. 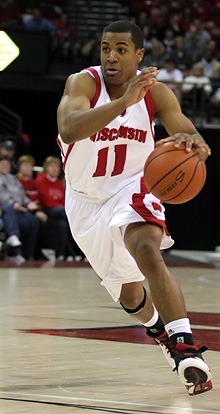 I’m not suggesting he will become Trevon Hughes but he certainly looks ready to anchor Bo Ryan’s backcourt. He’s also lucky enough to have able big men in Jon Leuer and Keaton Nankivil. Devoe Joseph – So. – Minnesota (Stats) – Joseph’s first two years in the Twin Cities have been up and down but he might finally be starting to figure things out. The Canadian guard averaged 13 points and 4 assists over his last 13 Big Ten games with a 53% eFG% as he led Minnesota to the Big Ten Tournament finals and a surprise NCAA bid. The other good news for Joseph is that he has the opportunity to be the leader of this year’s Gopher team with Lawrence Westbrook, Damian Johnson, Justin Cobbs, and Paul Carter all out of the equation. Obviously that productivity might be a hit in the W column for the Gophers but Joseph still has weapons in Ralph Sampson, Blake Hoffarber, Rodney Williams, Colton Iverson, and Trevon Mbakwe. Maurice Creek – So. – Indiana (Stats) – I honestly wasn’t sure whether to put Creek on this list. He put up ridiculous numbers in 12 games for the Hoosiers before suffering a nasty knee injury. Naturally those games included plenty of cupcakes but we are talking about a kid that scored 31 points on 14 shots versus Kentucky. If Creek is fully healthy for the entire season he will be the key to improvement in Bloomington.